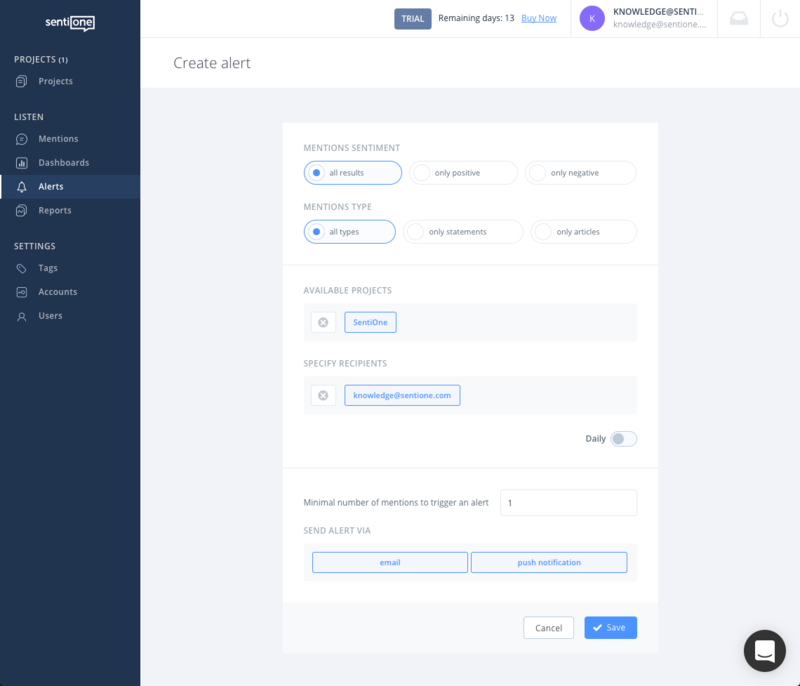 The Alerts module allows you to set and edit email notices about new mentions in selected projects. SentiOne can send you regular or critical alerts if certain project gets new mentions. By default, daily alert is added during the project creation. However, you can add new alerts anytime. To do so, click 'Alerts' icon on the left menu. Next, click 'Create'. In the alert creator, you will need to decide whether you wish to get a critical alert or a periodic one (daily summary). If you choose critical alert, you will get an email with every new mention right after indexing it in our system. Daily Summary will be delivered to your inbox once a day at the time of your choice. To set up a critical alert you should specify the minimum results count, results type (mention or article), results sentiment and which project it should apply to. You should also define recipients of the alert and delivery method (email or push notification). Critical Alerts are sent straight after collecting the required number of mentions in a chosen project. To set up a daily summary, you should specify the time of the day (when) you and other recipients will get the email. You can also decide if the alert should be sent even if there are no new statements. Daily summary can be only sent by email. Daily Summary is sent once every 24 hours and contains the summary of mentions collected during the day. Daily alert setup works analogously to the critical alert. - Minimal number of new mentions collected by the system necessary to send a new alert. - Projects – in this panel you can choose one or more projects for your alert. - Recipients – people who will receive alerts. - Delivery method – you can choose to receive alerts by email or by push notifications. In order to receive push notifications, make sure you have our mobile app downloaded.